Definitely not for average people: POWERdenim shorts are the tough cookies among our workwear jeans. 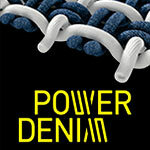 Tear-resistant, durable yet flexible: these properties come into their own in the POWERdenim. The extraordinary processing of the strong denim material makes these shorts ideal for anyone looking for more than just the standard, and like to feel comfortable even in the warmest of conditions. And what about you? Are you looking for something more? Trousers, almost stronger than steel: these jeans have hidden powers! Invisibly woven: the Dyneema® effect! 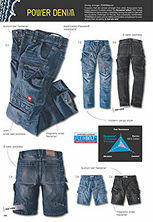 This makes the POWERdenim jeans unbeatably strong so they can withstand any tough challenge at work. Just as impressive: the comfort – POWERdenim jeans are incredibly comfortable despite their ruggedness.